Getting rid of pests can be tricky, but you should know that you have many different pest control options. Aside from purchasing toxic chemicals, there are some other (more appealing and environmentally friendly) options. The first thing that you will have to decide is whether you want to control pests in a humane manner or whether you'd rather just kill them. If you choose to go the humane route, there are many different types of pest control products that you can use. Somatherapy: Mice don't like this botanical "aromatherapy" Somatherapy formulation. It's non-toxic and supposedly is effective at driving mice away. The active ingredient is peppermint oil, which smells nice to humans but repels mice. Live Capture Traps: There are many different live capture traps on the market. Many of these traps are affordable, reusable and humane. 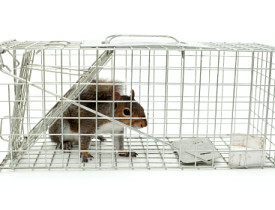 Check out products by companies such as Havahart to find a live capture trap for your particular pest problem. Shake-Away Animal Repellent: This non-toxic rodent repellent is made from dried bobcat urine. Mice can smell it but humans can't. Natural Ant Bait: Try this recipe for natural ant bait made from Borax and peanut butter. Catnip tea roach repellent: Catnip repels cockroaches. Spray strong catnip tea in areas prone to cockroaches, and leave sachets of catnip around the area. Of course, there are also pest control products on the market. Many of these products contain harmful chemicals and toxins. Chemicals such as Acephate and Bifenthrin can cause harm to both the environment and any humans that may come in contact with these toxins. If you are going to use a chemical repellent, make sure to purchase one that is comprised of non-toxic ingredients. There are many different reasons why calling an exterminator may be your only option. If any of the following scenarios sounds familiar, then it may be time to call the top pest control professional in your area. Your pest problem won't go away: If you've been battling the same pest for months, then you may have a larger problem than you originally thought. If you aren't sure which products are safe for you and your family, then you may want to consult with an expert. There are various types of exterminators available, and many of these professionals offer non-toxic pest control solutions. Pest prevention: If you are seeking preventative measures, these professionals can also ensure that your home is not a haven for future infestations. As with most other home-related issues, you can attempt to control pests on your own. In most cases, fighting a pest problem with an off-the-shelf solution is entirely effective. It's only when those off-the-shelf products are no longer working that it's time to call in the professionals.